Goddess Kali is one of the most worshiped Goddesses of Hindu Religion as the destroyer of evil and compassionate mother who loves her devotees.Maha Kali is easy to please and usually worshiped by tantriks to achieve special siddhis. 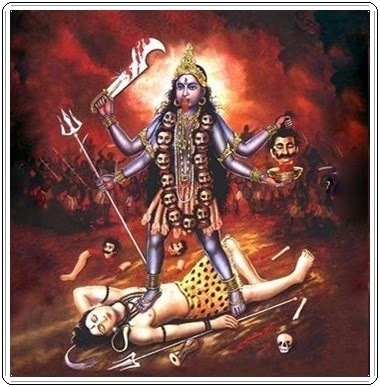 Goddess Kali is the goddess of liberation and worshiped in her destructive mode. Kali Ma is terrifying to look at, black and furious, with four hands, dripping blood and dressed in skulls. She is shown with one foot on Lord Shiva and with her tongue sticking out. She is also the first of the ten Mahavidyas . "Om aim hrim klim camundayai vicche svaha"